Customer data indicates that using our online giving and promoting it has shown to increase giving by over 15%. We offer 2 flexible plans for you to choose from. Upgrade at any time. If your account has fraudulent charges or falls victim to card testing it helps us to be able to refund the mass amounts of fees that could happen. The cost of PCI compliance, which allows us to pay the fees for you as well as all the extensive paperwork/forms you would normally have to fill out to be pci compliant yourself. * Minimum Giving: For Express account, if you do not get $300 in online giving for a particular month, there is anywhere from a $1- $10 charge to cover merchant account fees for that month. For instance, if you get only $150 in giving, you would pay $5. * Settlements: Giving is sent to the depository account the following business day and they should be deposited into the business account the day after that. So, total time from the time a donation is made until it is put into the depository account will be 2-3 business days. Always ask specifics from anyone you choose regarding this. Convenient Giving encourages first time givers and allows faithful givers to give more regularly. Give church members access to online donations through the mychurchwebsitegiving mobile platform & your own mobile giving app. Works on any smartphone or tablet, including Apple and Android devices. The mobile account is integrated with your online giving, text giving and kiosk giving account. View total electronic giving information for your church from within the app. We'll create and link up all your giving buttons on your church website so no matter how people access it, they'll easily be able to find your online giving. With giving kiosks, members and visitors can directly give on site. Manage your sign up forms through your kiosks for volunteers, mission trips, vacation bible school, etc. Want to accept donations through Facebook? We have an app for that! Simply add the Mychurchwebsite Giving Facebook App to your organization's Facebook page, and your donors can click to donate directly from your Facebook page and from their own Facebook home screen. Add on text giving to your Mychurchwebsite Giving account and receive a dedicated 10-digit phone number specifically for your church. Members can easily sign up in one minute and begin texting their donations to your church. Mychurchwebsite giving provides an online giving solution that is as unique as your church. Flexible payment options ensure you’re in control of your online giving and members can give easily and regularly. A steady stream of recurring giving is the number one reason for churches and ministries to accept online giving. When members set up recurring giving, you don’t have to worry about people skipping a week – it creates consistency and improves giving habits, as well as helping during vacation season when fewer people are giving in church. With Mychurchwebsite Giving, you have the option to ask your donors to add 2%-3% to their donation to help cover the processing costs by the card issuing banks (Visa, MasterCard, etc.). This option adds a line item to your donor portal and when selected by the donor, automatically calculates the addition to their donation. Did you know that donors are 7x more likely to donate to a branded donations page vs. an unbranded one? Create your own look and feel with Mychurchwebsite Giving. Manage multiple missions and funds with custom giving pages with the multi-site support feature. MyChurchGiving can accept any form of electronic payment (debit, credit, and eCheck/ACH), but you have complete control over what forms are accepted by your church. If you want to exclude just credit cards, your account can easily be limited to only accept debit and eCheck/ACH. Let Mychurchwebsite Giving's powerful control panel help you manage the data from your online giving. Whether you need your giving data to tell a story, to export to another system and to remain as secure as possible, we have you covered. Do you need to import donation data into CCB, ACS, Shelby, TheCity, HelpMate, PowerChurch, Church Office Online, Servant Keeper, By The Book, or another system? Let us know how you want the data, and we'll set up a free custom import/export profile. Mychurchwebsite Giving adheres to the industry's strictest security requirements. Concerning PCI & DSS Compliance Security, intrusion detection, and SSL transaction security, our team and data center goes above and beyond the required procedures. Growing your church shouldn’t mean you have to step up to the next price bracket. With every plan, you have access to the same unlimited features to manage your online giving. Create unlimited funds (missions, tithes, offerings, etc) for your members to give to. You are not capped to the number of campaigns you have running at any time. Members can even give to multiple funds at one time during their checkout experience. Easily manage multiple campuses by creating custom giving pages for each individual site with site specific funds. Campuses can be physical locations or you can create individualized pages for other missions within your church. We won't nickel and dime you like nearly every other provider out there. Whether you have 50 people donating online or 50,000; we won't charge you more because you have more. Our online giving solution has been developed for churches for the past 12 years. Over that time, we’ve learned how Mychurchwebsite Giving tools can support your needs beyond the ability to accept and track online donations. 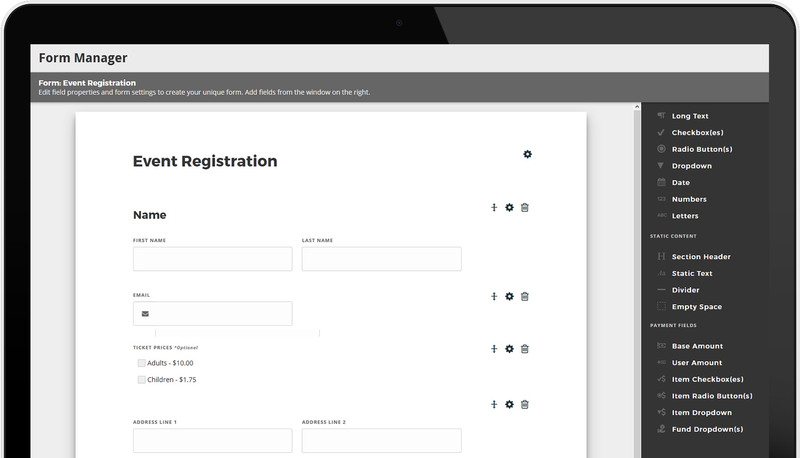 Create custom forms to tailor your specific needs in your church, such as special donations, mission trips, store items, or event registrations. You can then embed the forms into your website or link to them. As your partner in online giving, we will provide you with everything your church needs to launch a generosity campaign, how-to instructions for your members, graphics to share on social media about your tools, emails, instructional videos and more! Do we have to be a mychurchwebsite.com client to use your online giving service? No, you can still sign up for just our online giving program and use it on your own church website. What do we need to setup account with you? The license is required for the safety of both parties. We have seen several instances where a fraudulent person will try to sign up with faulty information, thus we want to verify who they are. We also like to make sure they are in good standing with the church, that way not just anyone is opening an account for them. The information is safely stored in your account and is not going to be sent anywhere to a 3rd party. Givers will click on a GIVE ONLINE button on your church website that we setup for you, which will take them to your giving portal website to conduct the transaction. Are there any maintenance fees for changes like adding a fund category, or a new report? There is no charge for changing fund categories. There are many free reports that you will have access to, but since we build these reports ourselves it would be unrealistic for us to say yes to all requests. We will however do what we can to fill these requests for custom reports not available in the system, with perhaps an extra cost involved. Where do I download the mobile giving app from? There are no long term contracts you have to agree to.